Plot Summary: In the distant future, a soldier named Eiji travels to the Ring Colony in search of "Beauty Memory", who is said to contain all of mankind's memories. Upon meeting Beauty on a hilltop, he is told to obtain "Amuro's Legacy" from outside the Ring to unlock her data. 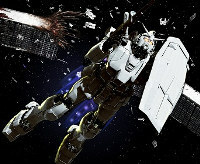 After stealing a Gundam from the colony, Eiji and Yuria venture on a quest to discover the key to mankind's salvation. A 5-minute short film created by Yoshiyuki Tomino and the award-winning Robot anime studio to celebrate Gundam's 30th anniversary. It was based on an unused concept Tomino had intended for a feature-length film.